Bladeagotchi will no longer be updated from the start of 2012, as I lost nearly my entire collection in the floods of 2011. Bladeagotchi is now archived and kept online for historical purposes only. You Knock on a Jumping Door! 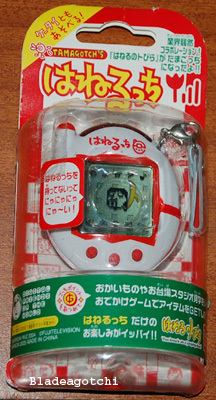 In early 2005, when the rest of the world were getting version two Tamagotchi Connexions/Connections, Bandai released the version two in Japan under the name "Tamagotchi Keitai". Keitai's had a new feature the V2's didn't have - Keitai's can communication with Japanese mobile (cell) phones! (For more info on normal Ketai's, visit Natasja's site). In Japan, there is a television show called "Haneru No Tobira" and it's slogan is "You Knock on a Jumping Door". I think it's a stand up comedy show or something (you can view it's Japanese website if you want, but be warned, it's not in English). 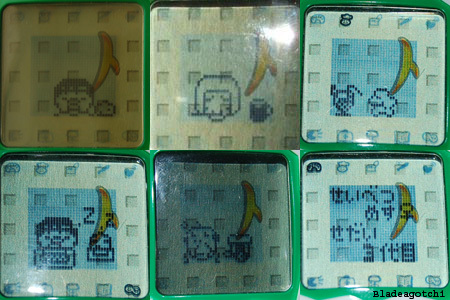 Anyway, they got in contact with Bandai, and made a special Tamagotchi Keitai modeled on the TV show sometime in early 2005. They called it the Hanerutchi, also spelt as Hanerucchi, Haneruchi and Hanerochi, and abbreviated a 'hanu'. And because it's a Keitai, it can talk to Japanese mobile (cell) phones. The Hanerutchi Keitai comes in THREE designs only - red, green and now a blue one too! The red and green came out in early 2005, and the blue one came out in January 2006. I own one red one and one green one, but I haven't taken the red one out of it's packaging yet, and the blue one is so rare it's nearly impossible to find. The red one has a red strip on the front and red screen trim, and the back of it is solid red. The green one has a green strip on the front and green screen trim, and the back of it is solid green. The new blue one has a blue strip on the front and blue trim, and the back of it is solid blue. The blue one also has a pearly white sheen, so I believe it's a limited edition one. The piece of cardboard that is behind the screen shows some small squares in a grid pattern, and a Banana. There's also a Banana on the packaging. Maybe it has something to do with the TV show? Pictured above is some of the characters that are shown in the instruction book. I haven't translated the names of them yet, and I am pretty sure that doesn't list all the characters either. The first time you run a Hanu unit, you'll always get the character with the long hair (shown above, in the middle row, on the left). After that, the characters depend on how well you treat your Hanu, and on if it has breeded with another Hanu unit. So far, I've been able to get it to communicate with the Akai Keitai (the tama with the red screen), and I think they'd talk to normal Keitai's too. I haven't tried getting it to talk to a V1 or V2 Connexion yet. The packaging has a backing card with all sorts of images on it, and it's pictured above. I believe these are possible characters and some screen shots of the Hanu. This backing card was from my green hanu, I just checked and the backing card on my red hanu and it is in red. The actual screen pixels and icons are the normal black though. I hope to have more photos of the characters soon. The screen is very crisp and clear. I was most impressed. Suprisingly, they aren't very needy - my current adult character only loses four hearts a day. Also, to pause a Hanerutchi, you firstly go into the clock and then press the left button and right button together at the same time - the clock will then say "Set". To Unpause, use the left button to increase the hours and then middle button to increase the minutes to the correct time, and then press C to confirm. The clock will start running normally, and the Hanuretchi will too. 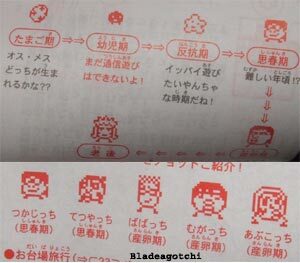 As with the Tamagotchi Connexion/Connections/Plus/Ketai's, you don't need to have more than one unit to have Tama babies - three days after the Tama changes into an adult, a Matchmaker (called Mrs Busybody) will appear on the screen with a suitor twice a day - I know she comes at about 7pm - and when the suitor is shown, the top option is Accept, the bottom option is Decline. The neat part is, that any items you've bought and the points you earn will carry over to the next generation. Beware, if you keep rejecting them (over three days), Mrs Busybody will stop coming and your Tama will die of old age later, and you'll lose all your items and points! The instruction manual is something like 50 pages long, so I don't think that I'll be translating it into english any time soon. Having said that, they're very easy to get the hang of. I highly recommend getting at least one if you get a chance, you won't regret it! Copyright © 1996 - 2016 by Blade.